Diamond’s new CP5H is a five band (40M, 20M, 15M, 10M and 6M) trap vertical antenna with trap radials. Its light weight, 6.6 pounds, makes it very manageable during the installation process and will allow for a simple mast solution. 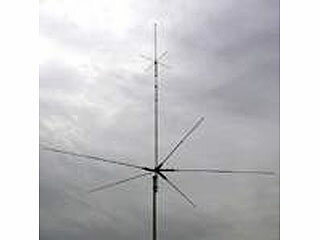 It is 11.8 feet tall and the radials are 71” long and can be mounted 360 degrees around the antenna or concentrated on one side if you need to mount it close to a structure. Because of its light weight and the ability to concentrate radials on one side, the CP5H could be used in an antenna restricted situation where the mast was lowered on its side during daylight and raised while operating during the evening. 500 W P.E.P. @28/50 MHz, 400 W P.E.P. @14/21 MHz and 200 W P.E.P. @7 MHz. Mast Diameter Acceptance: 1.2" - 2.3"